Our apartment homes feature large living and kitchen areas perfect for socializing with friends, restful bedrooms with ample relaxation and study space, beautiful furnishings and appliances, bright and attractive lighting, comfortable and efficient climate control systems, expansive HDTV channels, gigabit internet, and plentiful storage. King Henry honors the BYU Honor Code. Outstanding Amenities – Live the Definition of Fun! Simply step out your front door to enjoy King Henry’s acres of lawn and sports fields, our sparkling pool and luxurious spa, or the beautiful clubhouse with its fireplace lounge and gathering spaces. Hungry? Why not meet up with friends around our fire pits, BBQs, or outdoor pizza oven? When you’re ready to work it out, look no further than our full-sized sand volleyball and basketball courts, visit the gym in the clubhouse, or attend one of our famous poolside dance parties! 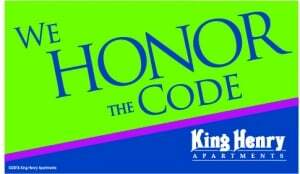 Simply stated, The Definition of Fun is King Henry Apartments! With Apologies to Brother Brigham, This is the Place! College life is about sharing once-in-a-lifetime experiences with good friends and making amazing memories. King Henry is home to good people doing good things and making lasting friendships. We feature five outstanding LDS student wards in a community where you’ll rub shoulders with over 600 fellow students from all over the US and many other parts of the world. Don’t Miss Your Chance to Experience the Best – Live At King Henry Apartments! Don’t Miss Your Chance For The Best There Is – Live At King Henry Apartments!